Using only U.K grown wheat for untreated, unbleached flours, Oxfords Bakery produce traditional products of the highest standards. Using long fermented doughs, making each product by hand and baking it fresh that morning for our customers to buy. 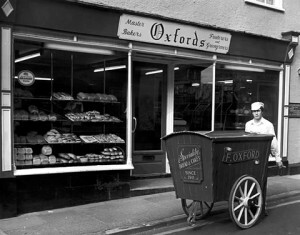 The original ovens used by Frank Oxford, the bakery’s founder, are still used today to bake the same quality products! See us at other farmers markets, county shows and steam rallies across the south of England!